When is a Big Mac not a Big Mac OR The day Supermacs 'Beat' McDonald's. When is a Big Mac not a Big Mac OR The day Supermacs ‘Beat’ McDonald’s. As the internet goes into full on meltdown about a decision of the EUIPO, Irish national pride is on display in a way not seen by this trademark nerd since Italia ’90. Yes, Supermac’s beat McDonalds. This is the Mighty Ducks of the Fast Food World. As I posted yesterday, as things stand this decision changes nothing. Not. One. Thing. That’s because McDonald’s has a nearly identical trademark in the EU for ‘Big Mac’ which was registered last year, and which still stands, and hasn’t even been challenged yet. 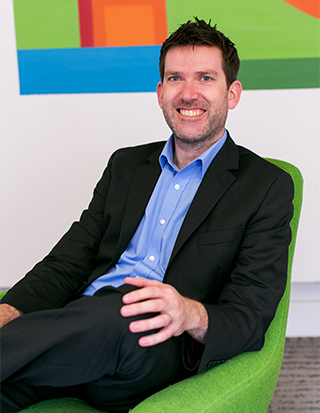 “If you don’t use a trademark, you can lose a trademark. McDonald’s didn’t show they had used it in the last 5 years, so they lost it”. 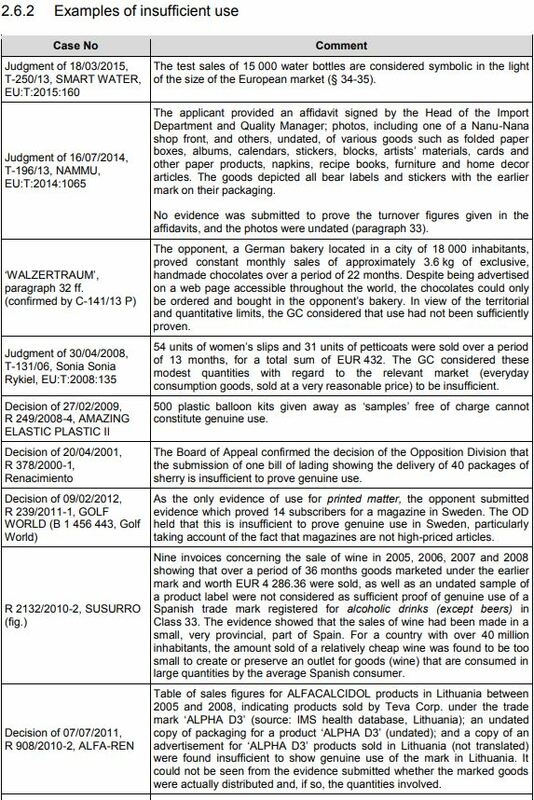 The law across Europe (and most trademark regimes globally) provides that if you don’t use your trademark for the goods and services for which it has been registered, then anybody can apply to cancel/revoke that trademark on the basis of non-use. It is also a defence to trademark opposition proceedings and infringement proceedings (where you are entitled to seek use of the mark from the party with the earlier trademark who is opposing your trademark). The trademark that was revoked is EU Trademark registration number 000062638. Class 29 – Foods prepared from meat, pork, fish and poultry products, meat sandwiches, fish sandwiches, pork sandwiches, chicken sandwiches, preserved and cooked fruits and vegetables, eggs, cheese, milk, milk preparations, pickles, desserts. Class 30 – Edible sandwiches, meat sandwiches, pork sandwiches, fish sandwiches, chicken sandwiches, biscuits, bread, cakes, cookies, chocolate, coffee, coffee substitutes, tea, mustard, oatmeal, pastries, sauces, seasonings, sugar. Class 42 – Services rendered or associated with operating and franchising restaurants and other establishments or facilities engaged in providing food and drink prepared for consumption and for drive- through facilities; preparation of carry-out foods; the designing of such restaurants, establishments and facilities for others; construction planning and construction consulting for restaurants for others. You could also argue that their description in Classes 29 and 30 are too broad, because Big Macs are not and never been “fish sandwiches, pork sandwiches, chicken sandwiches” nor have they ever been coffee etc. I say you could argue because it’s a little bit unclear from the way commas and semi colons are used in the above to draw the lines. McDonald’s simply could not prove they had been using the trademark for these goods/services for the last 5 years, because they haven’t been. The methods and means of proving genuine use of a mark are unlimited. The finding that genuine use has not been proven in the present case is due not to an excessively high standard of proof, but to the fact that the EUTM proprietor chose to restrict the evidence submitted (15/09/2011, T‑427/09, Centrotherm, EU:T:2011:480, § 46). (emphasis added). Brochures and printouts of advertising posters, in German, French and English, showing, inter alia, ‘Big Mac’ meat sandwiches; and packaging for sandwiches (boxes); the materials appear to originate from the EUTM proprietor and are dated between 2011 and 2016. The brochures and posters show a sandwich on the menu along with other products, or on its own, and the prices are also provided on some of the materials; other documents appear to be blank menus in which the price can be filled in. The EUTM appears on the submitted material in relation to sandwiches. Printouts from the websites mcdonalds.de, www.mcdonalds.at, www.mcdonalds.be, www.mcdonalds.cz, www.mcdonalds.dk, www.mcdonalds.es, www.mcdonalds.fi, www.mcdonalds.fr, www.mcdonalds.hu, www.mcdonalds.ie, www.mcdonalds.it, www.mcdonalds.nl, www.mcdonalds.pl, www.mcdonalds.ro, www.mcdonalds.se, www.mcdonalds.si, www.mcdonalds.sk, www.mcdonalds.co.uk, dated between 07/01/2014 and 03/10/2016. They depict a variety of sandwiches, inter alia ‘Big Mac’ sandwiches, some of which state that they are sandwiches made with beef meat. In very short summary, the EUIPO found that this evidence wasn’t enough to prove use. The EUIPO itself provides a substantial 86 page document on how they assess the issue of proof of use. They look at all sorts of things including marketing materials, sales figures, and evidence of every size and shape. You have to show ‘genuine use’ in the course of trade in a substantive part of the EU. Class 29 – Foods prepared from meat, pork, fish and poultry products, preserved and cooked fruits and vegetables, eggs, cheese, milk, milk preparations, pickles, desserts. Class 43 – Services rendered or associated with operating and franchising restaurants and other establishments or facilities engaged in providing food and drink for consumption and for drive-through facilities, namely restaurant services, preparation and provision of carry-out food. Well, here is where the plot thickens…..like a strawberry milkshake…..mmmmm milkshake. It’s been a quite common policy of brands who haven’t been using a trademark for a particular good/service and whose 5 years from the date of registration is about to run out (leaving the mark open to applications for revocation and cancellation) to apply again, for the same mark, for the same goods and services. Why? Because then they have 5 years from the date of that second registration to use the trademark again. Sometimes to keep up appearances, the application will be slightly different from the one that went before, sometimes it’s identical. This has given raise to the question about whether such registrations are made in ‘bad faith’ or whether there was a ‘genuine intent to use’ when they were applied for. The logic goes that the only reason for the second application is to stop someone applying to revoke the first application after 5 years. There isn’t a huge amount of caselaw on the question, but it’s becoming an increasingly talked about issue and topic. 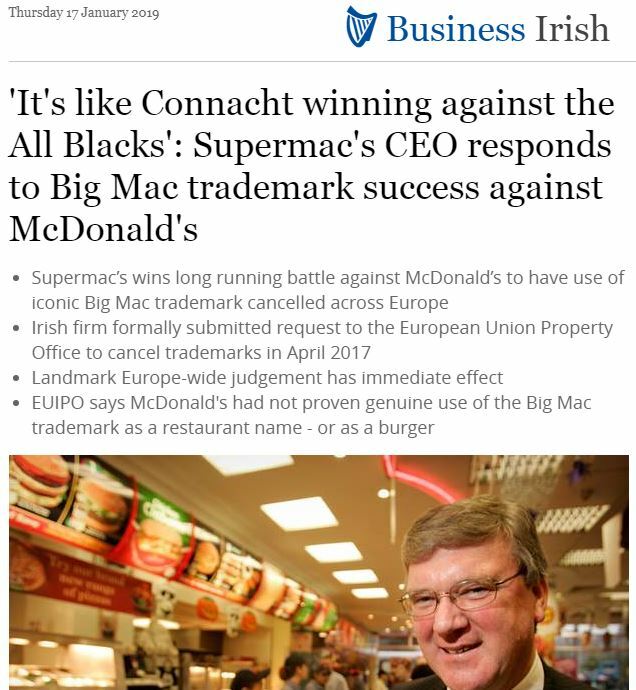 Here, specifically, Supermac’s applied to revoke McDonald’s ‘Big Mac’ trademark on 11 April,2017. McDonald’s applied for its new Big Mac trademark 6 months later on 6 October, 2017. But we’re a long way off that yet. To put it in context, in my view, it’s the difference between Connaught beating the All Blacks in a friendly where nothing much was riding on it and Ireland beating the All Blacks in the World Cup. A win is a win, but some matter more than others. McDonald’s International Property Company, Ltd., 2711 Centerville Road, Suite 400, Wilmington, DE 19808, United States of America (EUTM proprietor), represented by Bardehle Pagenberg Partnerschaft mbB Patentanwälte, Rechtsanwälte, Prinzregentenplatz 7, 81675 Munich, Germany (professional representative). The application for revocation is upheld. The EUTM proprietor’s rights in respect of European Union trade mark No 62 638 are revoked in their entirety as from 11/04/2017. The EUTM proprietor bears the costs, fixed at EUR 1 080. The applicant invoked Article 58(1)(a) EUTMR. The applicant argues that the EUTM was not put to genuine use during a continuous period of five years following the date of registration in relation to any of the registered goods and services. The applicant requests that the EUTM be revoked in its entirety with an earlier date, namely five years from the date of registration. In response to the application for revocation, the EUTM proprietor filed evidence of use, which is listed below in the following section of the present decision. The EUTM proprietor claims that the EUTM is used in a number of Member States. It also states that the submitted evidence shows that the mark has been used in advertising and on the packaging of the goods that have been marketed. It is also claimed that ‘as commonly known and attested to in the affidavits’ millions of products were sold under the EUTM. The EUTM proprietor finally concluded that if the Office considers the evidence to be insufficient to show genuine use for all of the contested goods and services, then the application for revocation has to be rejected at least in so far as it is directed against some of the goods and services (which it listed explicitly). The applicant argued that the evidence of use submitted by the EUTM proprietor is insufficient to prove that the EUTM was put to genuine use for anything other than sandwiches and it analyses the pieces of evidence individually. It concludes that the application must be upheld. The EUTM proprietor in its rejoinder states that the use of the EUTM in Germany, France and the United Kingdom, which are three of the economically most important Member States is sufficient to prove that the mark is used in the European Union. It further claims that the use of the mark for a sandwich shall also be considered as use for its ingredients. According to Article 58(1)(a) EUTMR, the rights of the proprietor of the European Union trade mark will be revoked on application to the Office, if, within a continuous period of five years, the trade mark has not been put to genuine use in the Union for the goods or services for which it is registered, and there are no proper reasons for non-use. Genuine use of a trade mark exists where the mark is used in accordance with its essential function, which is to guarantee the identity of the origin of the goods or services for which it is registered, in order to create or preserve an outlet for those goods or services. Genuine use requires actual use on the market of the registered goods and services and does not include token use for the sole purpose of preserving the rights conferred by the mark, nor use which is solely internal (11/03/2003, C‑40/01, Minimax, EU:C:2003:145, in particular § 35-37, 43). When assessing whether use of the trade mark is genuine, regard must be had to all the facts and circumstances relevant to establishing whether commercial exploitation of the mark is real, particularly whether such use is viewed as warranted in the economic sector concerned to maintain or create a market share for the goods or services protected by the mark (11/03/2003, C‑40/01, Minimax, EU:C:2003:145, § 38). However, the purpose of the provision requiring that the earlier mark must have been genuinely used ‘is not to assess commercial success or to review the economic strategy of an undertaking, nor is it intended to restrict trade-mark protection to the case where large-scale commercial use has been made of the marks’ (08/07/2004, T‑203/02, Vitafruit, EU:T:2004:225, § 38). According to Article 19(1) EUTMDR in conjunction with Article 10(3) EUTMDR, the indications and evidence of use must establish the place, time, extent and nature of use of the contested trade mark for the goods and/or services for which it is registered. In revocation proceedings based on the grounds of non-use, the burden of proof lies with the EUTM proprietor as the applicant cannot be expected to prove a negative fact, namely that the mark has not been used during a continuous period of five years. Therefore, it is the EUTM proprietor who must prove genuine use within the European Union, or submit proper reasons for non‑use. In the present case, the EUTM was registered on 22/12/1998. The revocation request was filed on 11/04/2017. Therefore, the EUTM had been registered for more than five years at the date of the filing of the request. The EUTM proprietor had to prove genuine use of the contested EUTM during the five-year period preceding the date of the revocation request, that is, from 11/04/2012 to 10/04/2017 inclusive, for the contested goods and services listed in the section ‘Reasons’ above. On 25/09/2017 the EUTM proprietor submitted evidence as proof of use. A printout from en.wikipedia.org, providing information on ‘Big Mac’ hamburger, its history, content and nutritional values in different countries. Having examined the material listed above in its entirety, the Cancellation Division finds that the evidence is insufficient to establish genuine use of the trade mark. Although some of the printouts of the proprietor’s web pages exhibit sandwiches (the prices are not provided), some of which marked with the EUTM, it could not be concluded whether, or how, a purchase could be made or an order could be placed. Even if the websites provided such an option, there is no information of a single order being placed. Therefore, a connection between the EUTM proprietor’s websites (irrespective of the used country code top-level domains and languages) and the eventual number of items offered (sold) could not be established. Assessment of the relevance, pertinence, conclusiveness and efficacy of evidence lies within the discretion and power of judgment of the Office, not the parties, and falls outside the adversarial principle which governs inter parties proceedings (decisions of 01/08/2007, R 201/2006-4, OCB, § 19;14/11/2000, R 823/1999-3, SIDOL). A declaration by the applicant concluding that evidence of use submitted is sufficient to prove use in relation to the contested goods does not, therefore, have any effect on the Office’s findings. It follows, that an overall assessment of the evidence does not allow the conclusion, without resorting to probabilities and presumptions, that the mark was genuinely used during the relevant period for the relevant goods or services (15/09/2011, T‑427/09, Centrotherm, EU:T:2011:480, § 43). It is up to the EUTM proprietor to show such use in a manner which allows a reasoned conclusion to be made that the use is not merely token. The methods and means of proving genuine use of a mark are unlimited. The finding that genuine use has not been proven in the present case is due not to an excessively high standard of proof, but to the fact that the EUTM proprietor chose to restrict the evidence submitted (15/09/2011, T‑427/09, Centrotherm, EU:T:2011:480, § 46). Considering the above, the Cancellation Division concludes that the evidence furnished by the EUTM proprietor is insufficient to prove that the EUTM was genuinely used in the relevant territory during the relevant period of time. The factors of time, place, extent and nature of use are cumulative (05/10/2010, T-92/09, STRATEGI, EU:T:2010:424, § 43). This means that the evidence must provide sufficient indication of all of these factors in order to prove genuine use. Failure to fulfil one of the conditions will lead to the evidence of use being rejected as insufficient and, as at least the extent of use has not been established, it is not necessary to enter into the other requisites. It follows from the above that the EUTM proprietor has not proven genuine use of the contested EUTM for any of the goods and services for which it is registered. As a result, the application for revocation is wholly successful and the contested EUTM must be revoked in its entirety. According to Article 62(1) EUTMR, the revocation will take effect from the date of the application for revocation, that is, as of 11/04/2017. An earlier date, on which one of the grounds for revocation occurred, may be fixed at the request of one of the parties. In the present case, the applicant has requested an earlier date. However, in exercising its discretion in this regard, the Cancellation Division considers that it is not expedient in this case to grant this request, since the applicant has not shown any legal interest to justify it. According to Article 109(1) EUTMR, the losing party in cancellation proceedings must bear the fees and costs incurred by the other party. Since the EUTM proprietor is the losing party, it must bear the cancellation fee as well as the costs incurred by the applicant in the course of these proceedings. According to Article 109(1) and (7) EUTMR and Article 18(1)(c)(ii) EUTMIR, the costs to be paid to the applicant are the cancellation fee and the representation costs, which are to be fixed on the basis of the maximum rate set therein. According to Article 67 EUTMR, any party adversely affected by this decision has a right to appeal against this decision. According to Article 68 EUTMR, notice of appeal must be filed in writing at the Office within two months of the date of notification of this decision. It must be filed in the language of the proceedings in which the decision subject to appeal was taken. Furthermore, a written statement of the grounds of appeal must be filed within four months of the same date. The notice of appeal will be deemed to be filed only when the appeal fee of EUR 720 has been paid.